Teacher Martin Aufmuth invented a machine in his laundry room that can make a complete pair of eyeglasses in twelve minutes. Teacher Martin Aufmuth invented a machine in his laundry room that can make a complete pair of eyeglasses in twelve minutes. His organization, OneDollarGlasses (ODG), uses this “portable optician’s workshop” to train communities to produce customizable eyeglasses, circumventing the traditional provider-patient model and affordability challenges that keeps glasses out of reach for so many people around the world. Martin's New Idea: Martin created a process that produces affordable eyewear on site anywhere in the world, significantly improving educational and economic opportunities for the vision-impaired. Locally trained opticians provide health education, free eye testing, immediate eyeglasses and fitting, as well as subsequent maintenance and replacement lens service. Martin’s model not only provides eyeglasses, it also provides jobs. ODG trains people of any educational level and background, providing income opportunities to disadvantaged groups such as youth, people with disabilities, and the homeless. By putting both production and distribution in the hands of residents and cooperating closely with local communities and infrastructure, Martin created a bottom-up social innovation that is profitable and independent from traditional patterns of development aid. A scalable solution, ODG works in remote areas, in countries such as Benin, Bolivia and Mexico. Since 2013, ODG has sold more than 150,000 glasses in 8 countries and has recently secured a partnership to provide glasses in India. 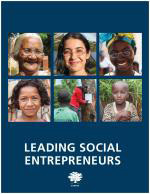 Martin' s story appears in the 2018 edition of "Leading Social Entrepreneurs" which features a selection of just a few of the Ashoka Fellows recently brought into the largest global network of social entrepreneurs. The LSE presents some of the newest innovations by leading social entrepreneurs whose ideas are changing the way things are done all over the world.